When the meals were delivered to the camp residents, N.G. Kamalawathi noticed that not everyone was eating. The camp, for Internally Displaced Persons (IDP), served regular meals, but people with hearing disabilities were often unaware that food was being served, and mobility-impaired residents could not reach the food quickly enough to eat it. These were some of the problems that Kamalawathi, President of the Association of Women with Disabilities (AKASA), recorded while visiting the camp, after the war, to assess the experiences of war-affected women with disabilities. 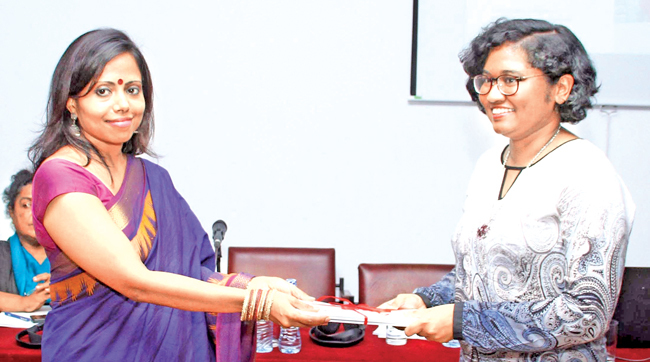 Binendri Perera (right) presents the report to Human Rights Commissioner of Sri Lanka, Ambika Satkunanathan. The word ‘disability’ has a broad meaning. It can denote cognitive, developmental, intellectual, mental, physical, or sensory impairment, or even some combination of these. In rural societies, where often no single word conveys the breadth of ‘disability’, it is expressed as a functional inability. For example, a woman might say, “I am unable to do what I need to do in the home like everybody else.” In urban areas, where the term ‘disability’ exists, people frequently fail to distinguish between the impairment and the person, calling them ‘disabled’. Language exposes social prejudice, but also, the vernaculars surrounding disability reveal absence - where discussions have not yet happened, where rights are waiting to be acknowledged or applied. This is exactly where the legal–academic report, “Out of the Shadows: War-affected Women with Disabilities in Sri Lanka,” begins, by breaking that silence. “Out of the Shadows,” a collaboration of authors, institutions, and countries, was written by Dinesha Samararatne, Karen Soldatic, a fellow at the Australian Research Council at Western Sydney University, and Binendri Perera, visiting lecturer, also at the Faculty of Law. It was sponsored in large part by the Law & Society Trust (LST), and was launched recently by Human Rights Commissioner of Sri Lanka, Ambika Satkunanathan. “This was done by the people, for the people, and for the rights of the people,” said Sandun Thudugala, Executive Director of the LST, at the report’s launch. “Out of the Shadows” looks at war-affected women with disabilities as a specific community that must contend with a unique set of barriers: the barriers faced by people with disabilities, how those barriers must be carefully navigated as women, and how those women must contend with the manifold obstacles of a war-affected context. “In developing societies and war-affected contexts, what happens is that resources are scarce. 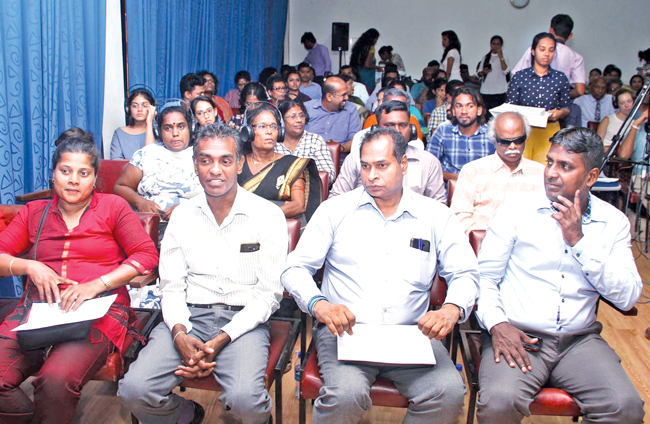 If it comes to a choice, what often happens is, people with disability, the elderly, they often end up being the sort of groups in societies that have the least access to these resources,” said Samararatne. As a community, war-affected women with disabilities have only ever been mentioned in two national-level documents before this one: the Lessons Learnt and Reconciliation Commission report (LLRC) in 2010, and the report of the Consultation Task Force on Reconciliation Mechanisms (CTF) in 2016. “Out of the Shadows” is a first step towards national acknowledgement and discussion of these women’s rights, which are the rights of all Sri Lankans, enshrined in the Constitution. Samararatne imagines a point sometime in the future when people debate and discuss the personal narratives of war-affected women with disabilities. But as of now, her goal is to create space in which to facilitate that discussion. 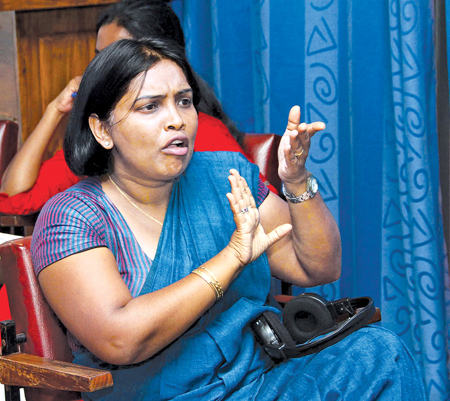 In Samararatne’s mind, this is the beginning of a long process for women who have largely been erased from mainstream political and social conversations. A section of the audience at the launch. In a post-war society like Sri Lanka, where people are divided by different languages, disabilities, and ethnicities, Samararatne and her colleagues realised that they would have to do research in a different way. One of the ways in which this study is unique, is how it places women with disabilities on equal footing with the researchers. Women with disabilities were not only the subjects of the study, but also the interviewers, integral to the process of data collection rather than passive subjects. While none of the authors have disabilities, they enlisted the help of AKASA, Navajeevana (Tangalle), Women’s Development Centre (WDC) and Viluthu (in Jaffna) to identify participants for the studies, and to conduct the interviews. One of the most wrenching findings in the report is that “women with disabilities who were interviewed for this study had no awareness of their human rights or about the concept of human rights in general. They were not aware of the idea of transitional justice or about any specific initiatives that were being taken by the government for reconciliation. None of them were aware of the process underway for Constitutional reforms.” This finding brings to light a dire need for these women to be acknowledged at a social and political level. Without it, they may not even recognise their own basic human rights. Another important finding of the document was the disparity between emergency and regular healthcare. “Almost all women interviewed for this study stated that the emergency healthcare they received from state hospitals was excellent,” the study says. Yet, on a day-to-day basis, “accessing regular healthcare services was difficult, due to lack of physical access, lack of adequate transport facilities and delays in the provision of healthcare.” Likely, the problems that women with disabilities faced in accessing regular healthcare are due to the fact that disabilities have not been normalised in society. For society to acknowledge war-affected women with disabilities, information must be reconsidered and the process of data collection restructured, so that it no longer erases their existence, explained AKASA President Kamalawathi. “There aren’t common statistics,” she said, “and not even the normal statistics are done correctly.” She pointed to the fact that few distinctions are made between women and men with disabilities in data figures. Data on education for people with disabilities does not distinguish between genders, though education is frequently less accessible to women than to men. National employment for people with disabilities, which does distinguish based on gender, reveals that only 41.1 percent of people with disabilities are employed, of whom 61.1 percent are men and only 24.4 percent are women. Kamalawathi says that there is a glaring need to disaggregate women’s disability research from men’s in Sri Lanka, where women may face added social inhibitors to their independence. The report attests to how inaccurate or missing information about war-affected women with disabilities makes them the most vulnerable community in a post-conflict situation. Without broad social acknowledgement and acceptance of their rights and needs, their abilities become squandered. They experience the highest levels of gender-related violence, abject poverty, stigmatisation and exclusion. And critically, the lack of improvement to their quality of life is evidence that deeper, unresolved aspects of the conflict still persist.